I’m coming up on seventy posted reviews for this website and I’ve written many other reviews on various book social websites like Goodreads, Booklikes, and such. 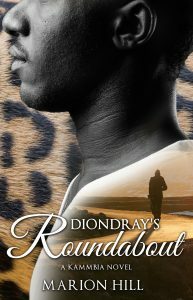 I have noticed there are some books you read and review because of their importance to the literary culture. There are some books you read and review and that you do not connect with but continue reading them to learn something from that experience. And there are some books you read and review that puts a smile on your face. Anniversary Day by Kristine Kathryn Rusch goes into the section of the aforementioned sentence. This is the eight book that I’ve read and review of the excellent Retrieval Artist Series and the first one of the Anniversary Day Saga. 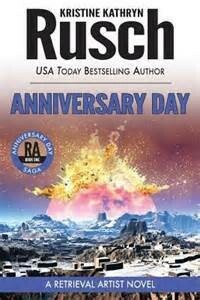 This first book of the saga focuses on the celebration called Anniversary Day where the moon colony of Armstrong remembers the bomb that destroyed part of the dome protecting it four years ago. A greater threat is happening on this Anniversary Day observance that not only affects Armstrong but the rest of the Moon. Moon Security Chief Noelle DeRicci is trying to stay one step of the unfolding disaster. However, the disaster is bigger than she could have ever imagined. She enlists Retrieval Artist Miles Flint for help and he learns just how widespread the disaster has become. The story in Anniversary Day does not revolve around Retrieval Artist Miles Flint. Moon Security Chief Noelle DeRicci and Detective Bartholomew Nyquist take center stage in Anniversary Day. That might be a disappointment for fans of the series who are attached to Miles Flint (like myself). However, Rusch is such a skilled storyteller than I have found DeRicci and Nyquist are just as compelling to read as Flint. I appreciate the fact that the series does not rely one character to carry it for subsequent books. The diversity of the characters is one of the main reasons I have become an unabashed fan of the series. I hope that other writers in series-length genre fiction can take inspiration from Rusch on this important technique. It’s hard for this reviewer to be totally objective for each book I post a review for in this series. It has become the literary version of Mad Men, House of Cards, or Breaking Bad for me. I have truly looked forward to reading each book in this series and glad to have seven more books of the Anniversary Day Saga to post reviews for. However, I will admit that I thought the ending (after being built up with great tension) was a let down for me. I understand why Rusch had to wrap a bow on the ending. But, I wanted at least another 40 or 50 pages of it for selfish reasons. That is my only quibble with Anniversary Day. I highly recommended this series and Anniversary Day is an excellent entry point for those of you who are newcomers to the series.